If you'd like to become pen pals with Hannah, leave a comment below with your email address so Hannah can contact you and you can swap addresses. 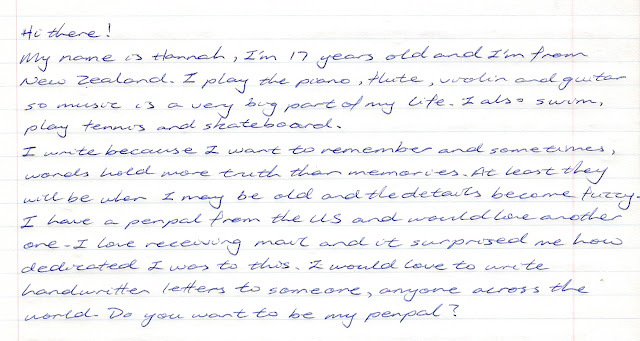 If you also want to place a call for a pen pal you can contact me, please read this article for more information: click. Edit: Hannah has found enough pen pals to write with. She will not contact new entries. 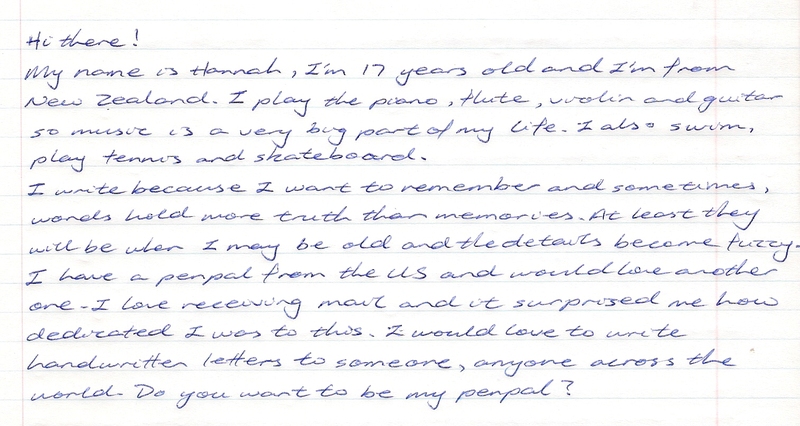 I'd love to become your pen pal! Here is a little about me, my name is Laura and I live in Escondido California I am 21 years old. I enjoy swimming, hiking, cycling, and arts and crafts. I have two Rottweilers, and two aquatic turtles, I'm a huge animal lover! Ill leave you with my basic information. I hope to hear from you but if not have a great day! Hi Hannah! My name is Anna and I'm 16,5 years old .I go to high school. I love to read, get the list (and write them) and the parcel and shop . I really want to be you pen pal. I hope you want too. My name is Sarah and I am also from the USA. If you still have time for another pen pal, I would love to send you some letters!